ANNAPOLIS, Md. 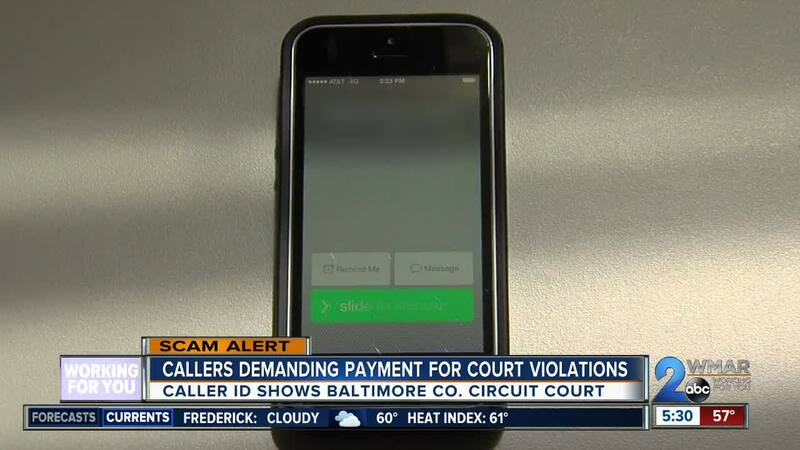 — If you get a call from someone claiming to be with the Baltimore County Circuit Court Clerk's Office and demanding money, you should hang up. The Maryland Judiciary sent out a warning about the new scam going around on Tuesday. Scammers are reportedly "spoofing" the phone number of the office to mask their real identity. If someone redials the phone number, they'll speak with the Clerk's office, but they're not the ones who called. WMAR-2 News Mallory Sofastaii reported on a similar scam going around this time last year. The callers were so convincing, a law professor almost fell victim to the scam. "They claimed that I had failed to show up, obey a summons in a criminal case, and that the judge had issued a bench warrant for my arrest and they wanted me to come in right away and straighten it out or they would have to come get me," said Professor Rena Steinzor, University of Maryland Carey Law School. The Maryland Judiciary is also reminding people that neither the Clerk’s office nor the courts make phone calls asking for payment or personal information over the phone or email. And if you have questions about this scam or any others, you're encouraged to contact the Office of the Attorney General Consumer Protection Division at 410-528-8662 or toll free 888-743-0023. To read the full warning, click here .